It’s back to the sweets with this week’s Tuesdays with Dorie, which I am excited to be co-hosting along with Spike, Jaime and Jessica. We’re doing David Ogonowski’s Chocolate Truffle Tartlets, and they are every bit as intense as the name sounds. A chocolate crust is the vessel for a dark chocolate filling loaded with milk and white chocolate bits and pieces of crunchy cookie (I used amaretti, but biscotti are suggested, too). The filling isn’t a straightforward ganache, but a baked chocolate filling made with whipped egg yolks. The ribbony yolks give the filling some lift and structure. They don’t bake up exactly cakey or moussey, but kind of somewhere in between. Although the recipe says they are best enjoyed day of, I thought the tartlets were fantastic eaten chilled the next day, when they were like candy bars. These tartlets may be small, but they pack a chocolate punch. A tartlet may be uaually meant for one, but I think these are so rich that they are made for sharing. A couple of notes about my personal experience here– I used a 60% chocolate in my filling base…I thought it was a tad too sweet when combined with the extra chocolate and cookie bits. Next time I’d go with a 70-something% for a bit more balance. Also, while the chocolate tart dough in this recipe is almost exactly the same as the one in BFMHTY, that one (BFMHTY) uses powdered sugar instead of granulated, and I think it may be a bit easier to work with. For the recipe, you should see Baking with Julia by Dorie Greenspan, but I also have it below. My co-hosts Spike, Jaime and Jessica will have it as well. Don’t forget to check out the rest of the TWD Blogroll. Steph’s Notes: You can watch the PBS episode of David and Julia making this recipe by viewing these links: Part 1 & Part 2. I added a pinch of salt to my tart filling. –To make the dough in a food processor: Put the metal blade in the processor and add the flour, cocoa, sugar, and salt. Pulse just to blend. Add the butter and pulse 8 to 10 times, until the pieces are about the size of small peas. With the machine running, add the yolk and ice water and pulse just until crumbly – don’t overwork it. Turn it out onto the work surface and, working with small portions, smear the dough across the surface with the heel of your hand. Gather the dough together and shape it into a rough square. Pat it down to compress it slightly, and wrap it in plastic. Chill until firm, at least 30 minutes. The dough will hold in the refrigerator for 3 days, or it can be wrapped airtight and frozen for a month. Thaw the dough, still wrapped, overnight in the refrigerator before rolling it out. –To make the dough by hand: Put the flour, cocoa, sugar, and salt on a smooth work surface, preferably a cool surface such as marble. Toss the ingredients together lightly with your fingertips, then scatter the butter pieces across the dry ingredients. Use your fingertips to work the butter into the flour mixture until it forms pieces the size of small peas. Then use a combination of techniques to work the butter further into the flour: Break it up with your fingertips, rub it lightly between your palms, and chop it with the flat edge of a plastic or metal dough scraper. Gather the mixture into a mound, make a volcano-like well in the center, and pour in the yolk and ice water. Use your fingers to break up the yolk and start moistening the dry ingredients. Then, just as you did with the flour and butter, toss the ingredients with your fingers and use the dough scraper to chop and blend it. The dough will be crumbly and not really cohesive. Bring it together by smearing small portions of it across the work surface with the heel of your hand. Gather into a square and chill as directed above. – Using an ice cream scoop or ¼ cup measure, divide the filling evenly among the cooled shells. Smooth the filling with a small offset spatula, working it into the nooks and crannies as you circle the tops of the tarts. Bake the tarts for 10 to 12 minutes, until the tops look dry and the filling is just set. Remove to a rack to cool for about 20 minutes before serving. Your tartlet is gorgeous! Thanks for hosting! Love how your tartlets turned out! ooh, such a pretty presentation for the little tartlet! I agree with your description of the intensity of this dessert. I used darker chocolate than yours, in the filling and in the chocolate cubes, and it was still sweet and rich and a little went a very long way. Thanks for hosting; very fun to see the new group taking shape. Beautiful presentation Steph! And I agree..these tarts were really delicious eaten chilled in fact, I prefer them this way. Did you use individual cheesecake molds to create this tart shape? Thanks! I have a stash of ring molds (tart rings) that I bought at a restaurant supply shop. They are bottomless and have straight sides. Your presentation is ridiculously beautiful! Very beautiful! I used the same tartlet forms and also served it with ice-cream, it was really good. Yours look so delicious!! Beautiful presentation as well. Thanks for hosting this! We loved these. Wonderful photo of yours. That segment on PBS really helped me to know what to do with these. We loved this one. Very delicious choice. Thanks!! Gorgeous plating! I added a bit of salt to the filling, too; I think most chocolate things benefit from it. I also used 60% chocolate, since I figured this book was written before the higher percentage chocolates were widely available. But I agree, it was on the sweet side, and I’m interested to see what it would be like with 70%. Yours look beautiful!! I like the shape. Omgosh, the presentation of your tartlets is just gorgeous! This is my first TWD post and I’m LOVING reading about everyone’s experiences. Thanks for hosting, this is a fantastic recipe!! Your tart is beautiful! 🙂 Thanks for hosting this week! It’s good to know that the tart recipe in BWJ uses granulated sugar…I’ve often come close to using it when I’m low on confecioners, but I worried about the texture. Love the straight sides on your tartlet — gorgeous! Love the photos! Your staging is just beautiful! Your tart is so beautiful! Thank you for hosting. I agree for the ‘leftover’ tarts. I froze and then thawed a few for a dinner party this weekend and while I expected them to be lackluster, they were just as good as the day they were baked! I love that you used ring molds – I think it is a much more elegant presentation. Very, very lovely. Thanks for hosting! I like the shape of your tartlet. It is so pretty! Yes, I agree that even the tartlets are meant for sharing because they are so rich, or at least you need to save the other half for later. I have made Dorie’s tart dough and it is a good one! The tartlet looks fantastic and I love the picture as well!!! You should give me some tips, I really need to improve on that!!! I adore your tarts! And I agree, these were definitely made for sharing! Steph—I’m losing my mind…Did I already comment on your photo and plating??? ?If not, I love it. If I did, I second that. See you soon? Great presentation! Did you make your own ice cream, too? Looks wonderful. I love you tart – the straight sides and the garnish are beautiful. Nice job hosting! Oh, that looks so delicious! What a lovely little tartlet! I love all the inspiration I’m finding through TWD. Thanks for sharing. Thank you for hosting this month. Stunning presentation! Your tartlet is so gorgeous! I used 60% and thought it was too sweet too, but my husband loves super-sweet things, so it was perfect for him. Beautifully presented! Thanks for hosting! Stunning plating…your tart looks perfect!!! Thanks for hosting! This was delicious! Love love love the photo. Wait…this is legitimately stunning (for lack of a more original word). Bravo! Lovely plating! As a last minute change, I decided to make the tart dough with powdered instead of granulated sugar. Glad I did, found it super easy and tasty. Thanks for hosting! Your tart looks perfect! Thanks for picking such an elegant & delicious recipe! It was so easy & produced such a great result! Yours are absolutely beautiful. My tart shells shrunk a bit in the pre-bake, and I had enough dough and filling for more than six tartlettes, so my shells runneth over a bit. But it was a lot of fun to do — thanks for hosting! Gorgeous photo! And I agree, I liked it better the next day! Cheers! Your tartlet looks gorgeous. Love the straight sides on the tart shell. Could you tell us what type of pan or mold you used? Thanks for hosting. I used bottomless tart rings. They are made by Gobel, and you can find them online and in some professional restaurant supply shops. I cant imagine eating a whole tartlet at once, so rich! Def need to share! Yes, these were very chocolatey and rich, and I had to eat mine small bites at a time! 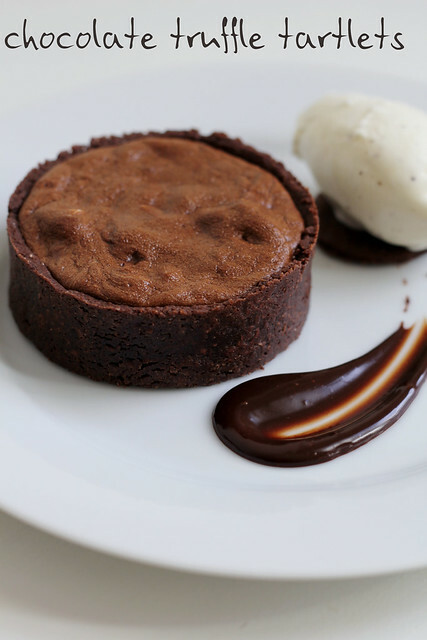 A beautiful tart – the smear of chocolate on the plate makes it a work of art. Wow it’s beautiful! Thanks for hosting! Best-looking tart by far! Great job hosting – Thanks! Your tart is just perfection. That little garnish-swoop of chocolate takes it over the top! Thanks for hosting/baking along with me this week.